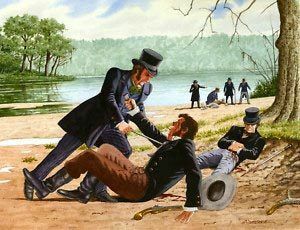 The Sandbar Fight occurred just north of Natchez, Mississippi on a sandbar in the Mississippi River on September 19, 1827. 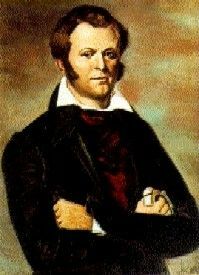 When two men, Samuel Levi Wells, III and Dr. Thomas Maddox, decided to solve their issues by participating in a duel, Jim Bowie attended as Wells’ “second.” In those days, a “second” always attended an “official” duel to ensure that the proper rules were followed. Surrounding the duelers were several spectators, including Wells supporters, Major George McWhorter and General Samuel Cuny. Supporting Maddox were his “second,” Major Norris Wright, Colonel Robert Crain, and brothers, Carey and Alfred Blanchard. Others were also gathered about to watch the spectacle, numbering about 16 men in total. When the principles exchanged shots, neither hit the other, but all hell broke loose. From the crowd that surrounded the duel, Robert Crain fired upon Samuel Cuny, and when Cuny fell, Bowie stepped in and fired at Crain but missed. Norris then shot Bowie through the lower chest, at which time Bowie drew his long knife, that he was known to wear, and began to chase down Wright. The Blanchard brothers then shot Bowie in the thigh, while Write and Alfred Blanchard stabbed him in several places. However, Bowie still fought back, plunging his long knife into Wright’s chest and slicing Alfred Blanchard’s forearm. Carey Blanchard then fired a second shot at Bowie then he and his brother, Alfred fled. However, Carey Blanchard was shot and wounded by Major McWhorter as he ran. James Bowie was an observer to the duel from a grove of trees with other Wells supporters & not a second to Samuel Wells upon the field of honor. I wrote a detailed account of the Sandbar Fight & the subsequent rise in fame of both Bowie & his knife. Search Knives 2018 book category at Amazon.com. Click on Look Inside feature & scroll down to my article shown in it’s entirety.